It is with great sadness that we announce the sudden passing of Rick on Sunday, October 14th at his home in Kelowna. Predeceased by his father Joe, mother Carol, sister Carolyn and nephew Geordie. Rick is survived by his wife Donna, “Mom” Peggy McKay, sisters-in-law Jeanette McKay and Lisa (Rick) Wilson, cousins Allan Ungaro, Karyn (Gary) Brandel, Joe (Christine) Ungaro, Mary (Mario) Potvin and Debbie (Norris) Fedorek and his closest friends Tim Dorssers, Charlaine Russell, Bonnie Coburn and Rick (Sherilyn) Given. Rick played competitive darts at the highest level for many years and will also be fondly remembered by his doubles partners Rob Raj, Dennis Morgan and Danny Shanks and great friends he met along the way. After giving up the dart life and moving back to Kelowna in 1992, Rick enjoyed spending time in the outdoors, fishing the small lakes and going ATV’ing. 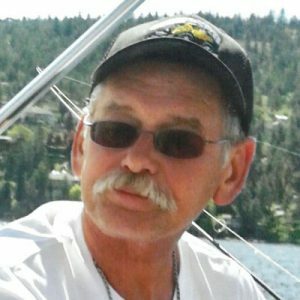 In more recent years he loved taking the boat out on Okanagan Lake and spending time with his friends. The service for BISARO, Richard (Rick) is scheduled for No service as per Rick’s request. Below you will find the map for the service location and the contact information should you have any questions. Farewell cuz!! You are missed more than you could ever know. Thank you for a lifetime of adventures. Donna I am sorry to hear the news of Rick’s passing. My deepest condolences to you, may he RIP. We are so sad to hear of the passing of Rick. lots of good memories!! Donna and Family, I was shocked to hear of Rick’s passing. He was a good guy and one H— (heck) of a dart player! I’ll remember quite a few moments we shared on the dart floors. God bless! !